The Fury of Firestorm may be starting to wind down, but that hasn’t stopped the Nuclear Man from getting around The New 52 lately! Below are a couple panels from this week’s Channel 52 strip. Check out ole Match-head! 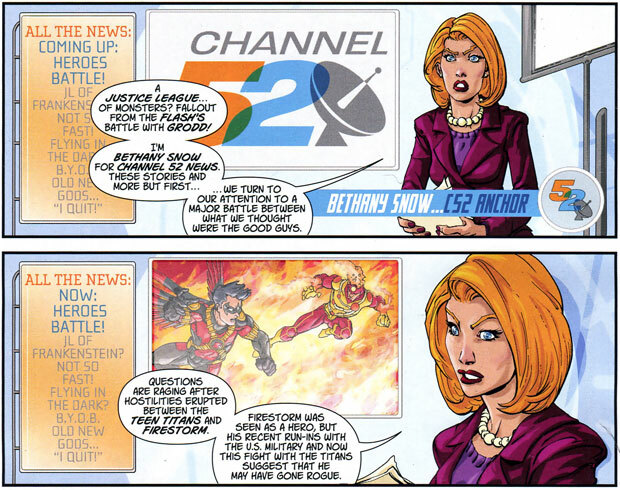 Also, I gotta say I was thrilled to see Firestorm and Ambush Bug appearing on the same comic page! Sorry, I cut my scan off just below Firestorm; Ambush Bug was featured in the panels beneath. Next up are a couple panels from Justice League #17 by Ivan Reis, Joe Prado, and Rod Reis! Not only do we get to see the Nuclear Man in action, we also get to see disembodied-Jason-head and Firestorm’s transmutation powers! 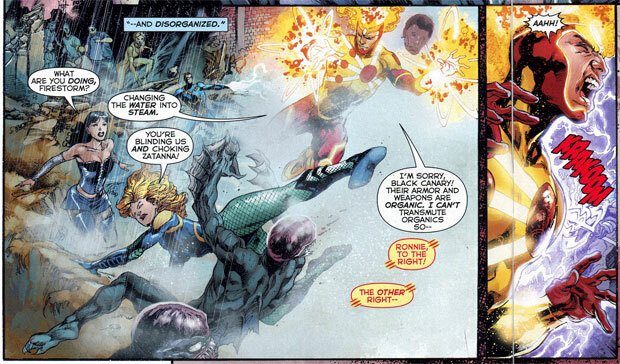 Be sure to pick up your copy of Justice League #17 to see more Firestorm! Nice to see our favorite hot-head getting around! Looking forward to seeing more of Firestorm as a member of the League! I’m really enjoying the new Channel 52 strips. I was thrilled to finally see Ambush Bug show up in the New 52. I’d be all for Firestorm joining either the J.L.A. or even another team!